I left off with that dreamy omlette, so I’ll resume my tale and take you through the 6th, past Les Invalides and add an addendum on our dinner. 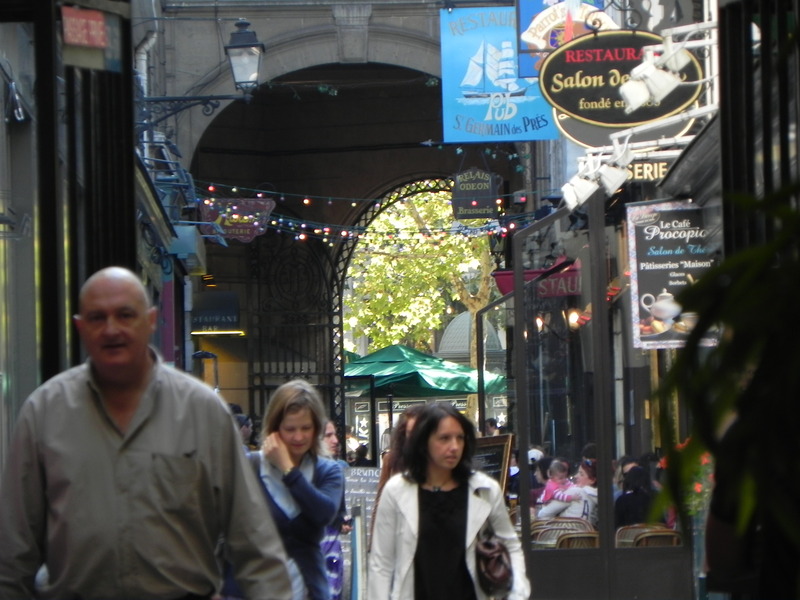 There is an abundance of strolling, shopping and old things in this area. Benjamin Franklin thought so too. Cafe Procope was his hangout, so it’s only fitting that I should honor his legacy with a cafe express. 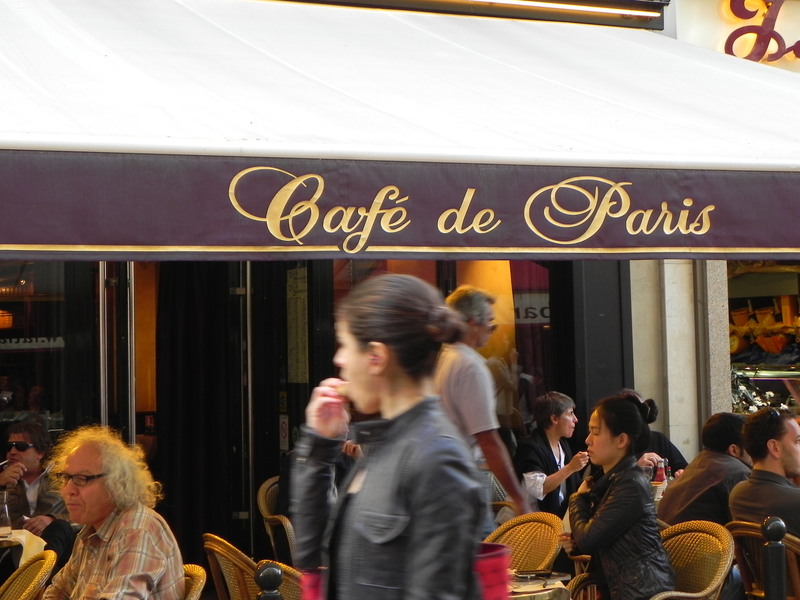 This cafe was the first to serve coffee in 1686. The Founding Fathers all organized business trips to Paris – and often left their wives at home. I wonder if they had French nieces too…. 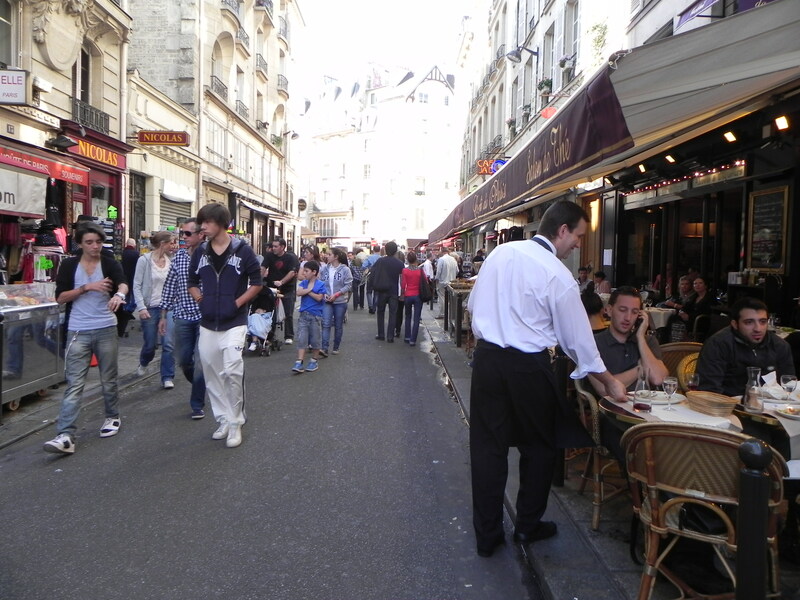 Experienced Travellers know not to travel the Rue de Bucci hungry. I was still luminous from the omlette, so it was a permissable route. This is the local marche, lined with cafes, epiceries, produce stands and shops. My hero Janet Flanner lived nearby on the Rue Jacob and it was a favourite area for The Lost Generation. I made my way down the Blvd. St. Germain and over the Rue de Grennelle, which takes me through Embassy Row. Hmm. Lots of police , the road closed to traffic and absolutely NO SOUND except footsteps on the pavement. Oh dear. Even ETs can’t plan for every turn of events. I kept my head down and walked. Very fast. I’ve been reading too much Alan Furst. This must be what the streets were like at night during the Nazi occupation. Alan’s heros duck into a doorway and press against the wall if a car approaches. Especially if they’re using forged papers and carrying microfilm. Fortunately, I had no need of doorways or false alibis. I emerged a little out of breath and regained my wits on a bench at the Invalides. 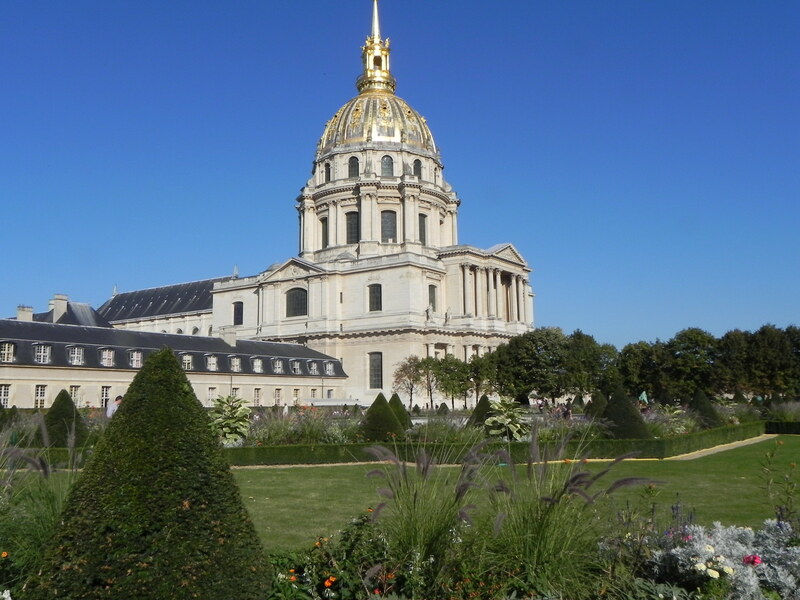 Les Invalides was established as a military hospital by Louis XIV – and his appetite for war consigned many of his troops to it’s care. It is still used as a hospital today, and houses the Army Museum and the very grand tomb of Emperor Napoleon. The gold dome is beautiful at night when it’s lit. The French are very very good at lighting monuments. They’re also very good at integrating contemporary art with ancient or historical buildings. 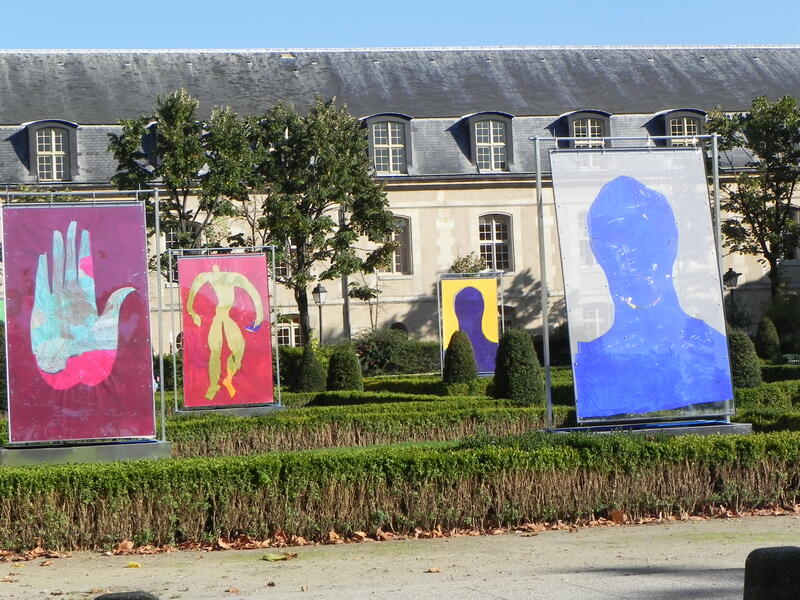 I admired this installation in the Invalides garden. Thank goodness it was time for dinner, and we had reservations at a wine bar called Number 7. My knowledgable friend Terese encouraged me to order the St. Emillion, and I always follow her advice. Now, I want to know if St. Emillion can be my new patron saint. Nurse, resplendent after a day of rest, ordered a crab and zucchini terrine topped with chopped lime that was so refreshing. 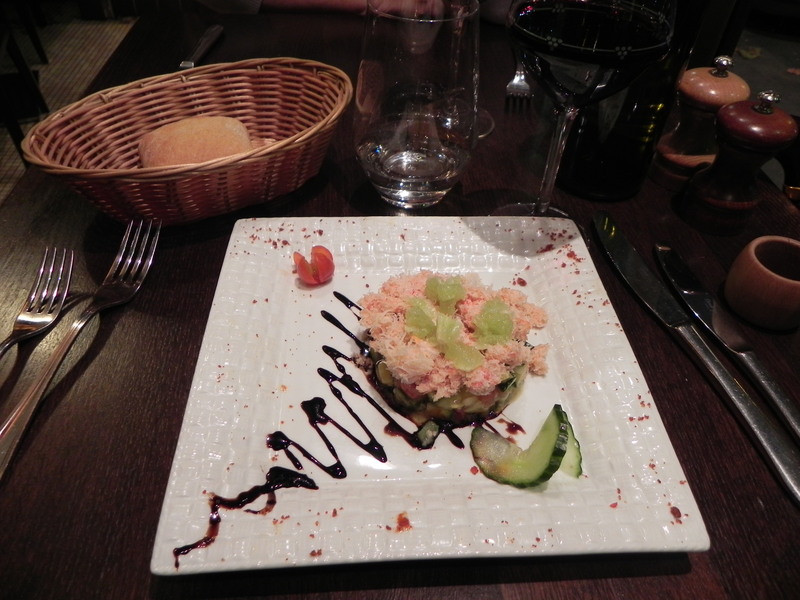 The plates were sprinkled with a very interesting paprika. So now we have to scour the market to find a small bottle for the suitcase. Crab zucchini terrine. I had enough wine to wonder how they got the zuchinni to stick together. This is where we learned that not all mashed potatos need to be mashed – some can be chunks! 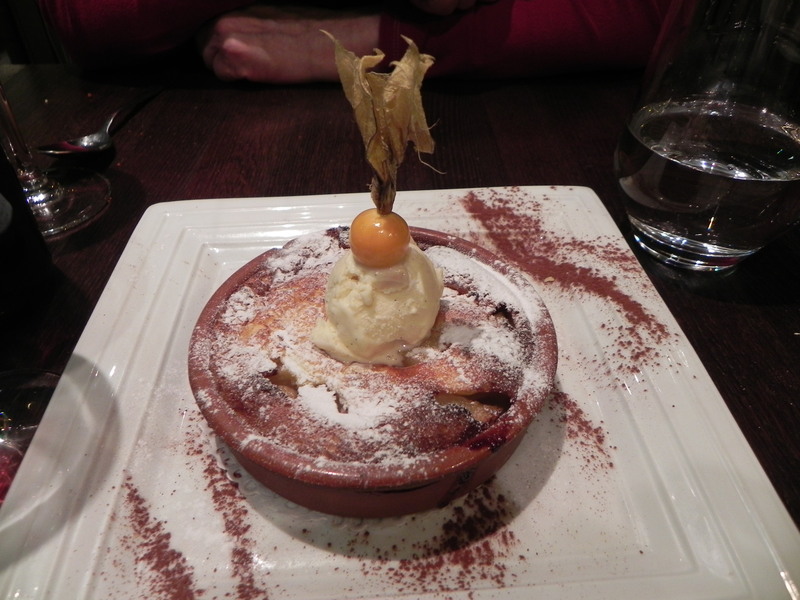 We finished the meal with a pear clafoutis and a cafe noir. Thank goodness I walked all day. I have a caloric theory that you can excercise ahead of time to offset the evening meal. This operates on the same principle as “found money” and is equally sound. The longer I spend in Paris, the more my theories are borne out. 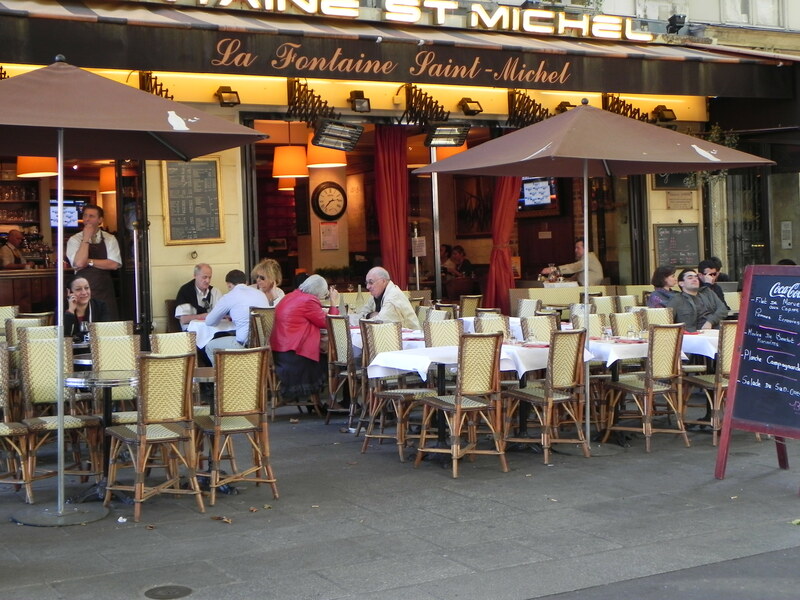 This entry was posted on October 11, 2010 at 3:40 pm and is filed under Dining, Paris sightseeing. You can follow any responses to this entry through the RSS 2.0 feed. You can leave a response, or trackback from your own site. 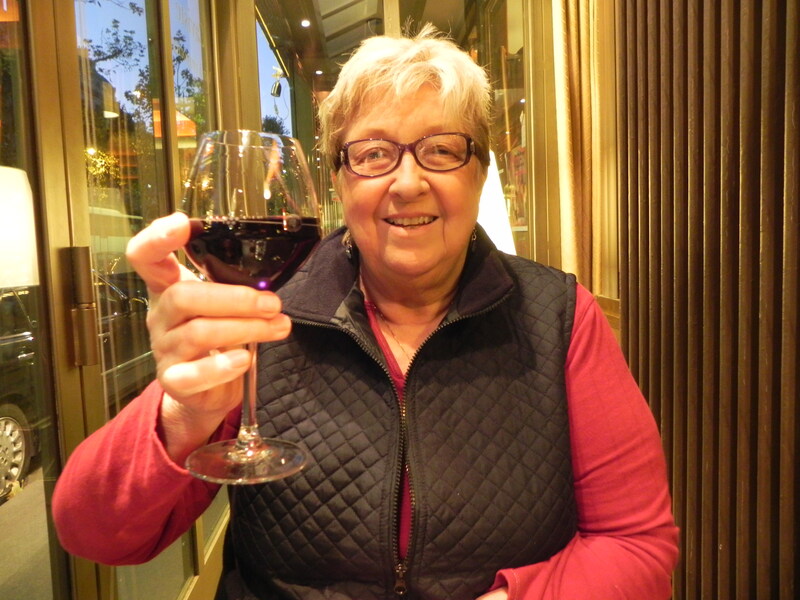 One of my most favorite wines – ever – is St Emillion! Back in the day I had a penchant for 1976 B&G St. Emillion. I may have consumed the majority of their export quota. Loved it! 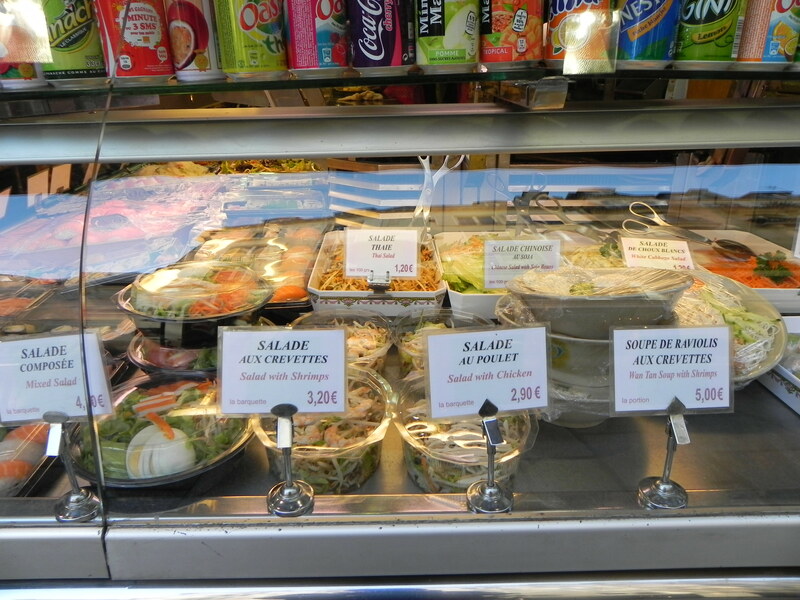 And I find it interesting that the take-away salads were all labeled in French and English! How très moderne ! The secret to the zucchini?!? Ring molds. Pack it in, lift it off. At home, one may use tuna cans with lid and bottom removed. Clafoutis are one of my most favorite desserts to make in a hurry. They are just too simple and have such wonderful flavor. I will have to try the individuals one of these days. Tim I bet the bilingual labels are designed to aid tourists who are too hungry to consult their food dictionary. And I will take better care with my used tuna cans! Thanks for the tip. I think we should all chip in and rent the apartment for 6 or 8 months and take turns testing your theories! Miss J – let’s figure out a way to write this off our taxes! What a perfect idea. Yes! 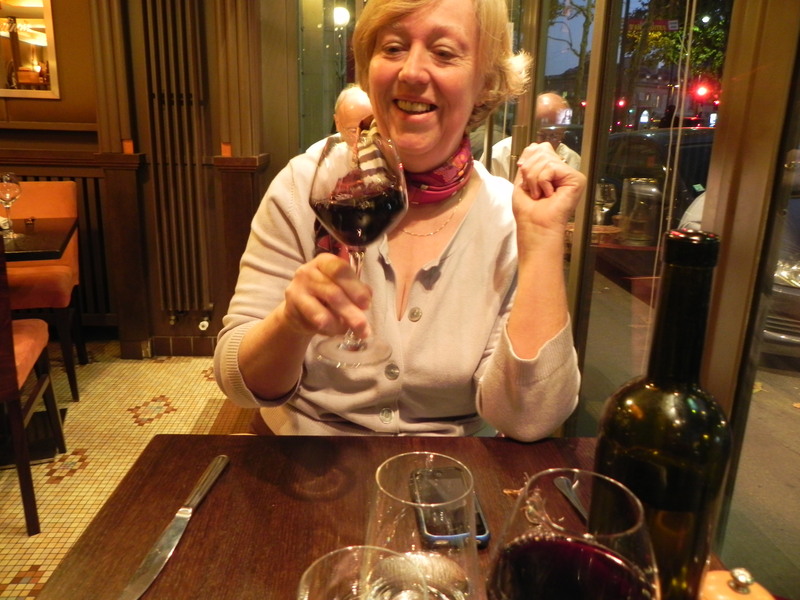 St. Emillion – it became my favorite “Bordeaux” wine. And what a beautiful little town up on a hill with wonderful views of the vineyards. It also has the historic monolithic church carved on the side of the hill. I had the most wonderful, exquisite, simple vegetable soup made out of local produce there. Next time you are in France, you’ll have to visit the town but Nurse’s back will have to be in good shape. There are some very steep hills and stairs. Anyway, I am becoming nostalgic . . . Oh, to be in St. Emillion . . .
Nurse’s terrine sounds just heavenly. Have been on a lime kick recently and love the little zing it imparts with every bite. Just love this blog. How can we flip this into a paid gig for you? St. Emillion is also a favorite of mine! I think I will serve it with our traditional winter holiday meal!